Parker Van Dyke’s winning shot is a career-defining moment for the senior. (Marcio Jose Sanchez | The Associated Press) Utah guard Parker Van Dyke (5) makes a winning three-point basket over UCLA guard Chris Smith (5) and guard David Singleton (34) as time expires during the second half of an NCAA college basketball game Saturday, Feb. 9, 2019, in Los Angeles. Los Angeles • Utah guard Sedrick Barefield shot an airball, with his team trailing by four points in the last 37 seconds Saturday. Somehow, the Utes ended up winning. UCLA guard Prince Ali escaped a trapping defense in the backcourt and passed the ball ahead to Cody Riley for a dunk that restored his team’s four-point lead with 16 seconds remaining. He's partly wrong, but mostly right. As those examples show, the Utes didn't completely overwhelm the Bruins at the end, with a rally from 22 points behind topped by Van Dyke 28-foot, buzzer-beating 3-pointer. Utah's runs of 46-23 in the last 12 minutes, 23-9 in the last three minutes and 8-3 in the last nine seconds required some cooperation from UCLA and considerable determination by the Utes. At various stages, Utah’s comeback looked like a nice effort that would go unrewarded. The key sequence stemmed from UCLA interim coach Murry Bartow’s decision to foul Barefield at midcourt, with the Bruins leading by three. The strategy was designed to prevent a tying 3-pointer — and it ultimately gave the Utes a chance to win. Barefield made two foul shots, UCLA’s David Singleton then missed and made free throws and Barefield dished to Van Dyke for the winning shot. The Bruins didn’t totally choke; they made 6 of 8 free throws in the final minute. But the Utes kept getting closer and finally took their only lead of the day after time expired. Afterward, Ute coach Larry Krystkowiak spoke of “a little bit spooky” belief that the Utes would win, even after they trailed 49-32 at halftime. His mind already was moving into this week, as he recalled how Utah recently swept Stanford and California on the road, only to lose at home to Oregon and Oregon State. Having beaten USC on this trip, Utah went 4-0 on the road against the Pac-12′s California schools for the first time. The Utes (13-10, 7-4 Pac-12) do need to follow through. They’re in a three-way tie for second place with Arizona State and Oregon State with seven games to play. ESPN’s Basketball Power Index now projects 10.1 wins for Utah in the 18-game conference schedule and a fourth-place finish. Going into the Pac-12 season, the BPI’s forecast was 6.1 wins and 10th place. More work remains ahead, though. The Utes are only two games above 10th place in the crowded standings. 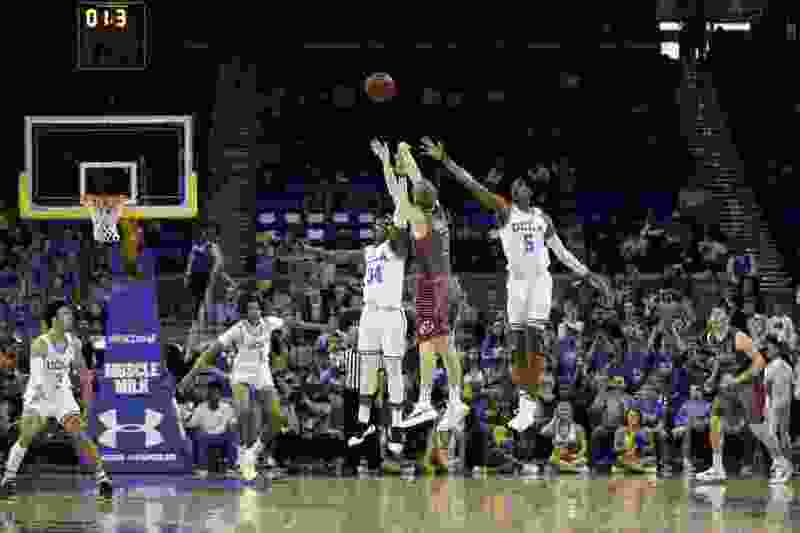 • The Utes themselves have played some poor second halves and lost big chunks of leads, such as allowing USC to get within seven points Wednesday after trailing by 23. Even so, the Utes’ comeback at UCLA was stunning, because of the way the Bruins were dominating them. UCLA scored 69 points in the game’s first 28 minutes. Utah, with a No. 24-ranked offense, according to the kenpom.com efficiency analytics, scored 61 points in the second half, including 46 in the last 12 minutes. And the Utes’ defense improved in that stretch, as UCLA went 3 of 11 from the field and had five turnovers. • The Pac-12 is crazy and fun. The conference likely will have only two NCAA Tournament teams, Washington and Arizona State, and college basketball is a postseason-driven sport. Yet for drama and unpredictability, the Pac-12 is producing all that anyone could want from a regular season. Consider what road teams did this past week: Utah and Colorado swept USC and UCLA, 11th-place Washington State swept the Arizona schools and Stanford upset Oregon State. • Van Dyke deserved Saturday’s moment. He nearly gave the Utes a history-making victory at Arizona, the Pac-12′s flagship program, but his shot rimmed out in early January. He got rewarded in UCLA’s storied venue, concluding a week when Krystkowiak took him out of the starting lineup as a way to energize Both Gach. Van Dyke responded with a rally-killing shot at USC and scored all of his 15 points at UCLA after the Utes trailed by 22. Riley Battin. The freshman forward from southern California made some mistakes and missed some free throws, but he totaled 27 points and 15 rebounds in two games, making it a breakthrough week for him. Battin scored nine points in the last 12 minutes at UCLA, finishing with a season-high 18. Utah freshmen Timmy Allen, Battin and Gach combined for 47 points Saturday. Van Dyke’s game winner at UCLA was a career-defining moment for the senior. And thanks to his shot, Utah’s alternate gray uniforms forever will be viewed differently. The Utes will host Arizona at 7 p.m. Thursday and ASU at 8 p.m. Saturday. Arizona is reeling at 5-6 in conference play, having failed to top 60 points in home losses to the Washington schools. Regardless, Utah is 1-13 against the Wildcats in the Pac-12 era and 2-3 in conference home games this season. Utah students usually respond well to Arizona’s visit. We’ll see if that happens again Thursday and if the Utes can sustain their momentum, as every Pac-12 team other than Washington has had trouble doing. 🗣 🎙Hear it from the man himself, Parker Van Dyke!